J Fred and I comparing notes. This weekend has been a happening one in Deer Isle Me we usually go throught the winter at a relaxed pace with freinds and potlucks and our studios but this weekend we had two shows that brought everyone out of their house to dust of our conversation skills and enjoy each other. Carolyn Hecker had a show at the Pearson Legacy gallery with theme being reflections. 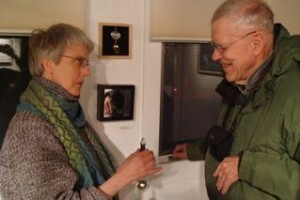 Isalos Gallery in Stonington had their annual red show. Red Again which was a lot of fun and drew a lot of cool artwork. This picture is of J. Fred Woel and I at Reflections show Fred with oneof his wonderful found object necklaces and me with my Sister Narssicus Ring A spinning nun with a book of mirrors so she can spin to get her reflection in the best possible light. Oh, I wish I’d been there, too! Please say hello to all our mutual friends! AND, please post a pic of the spinning nun and her mirror!